On sequels: "There's no sequel" because that would be "missing the point"
LONDON, England (CNN) -- "I mean, it's a weird movie," says "Watchmen" director Zack Snyder. "There's no two ways about it." Never was a truer word spoken about the graphic novel adaptation that has taken 23 tortuous years to get from the page to the screen. Director Zack Snyder on "Watchmen": "It's a weird movie. There's no two ways about it." Indeed, for many years, it was a movie that was considered impossible to make. Alternately described as the "Citizen Kane of graphic novels" and the "the unfilmable film," a legion of directors have been attached to the movie during its long life, including Darren Aronofsky, Terry Gilliam and Paul Greengrass. But for one reason or another, the project always stalled. More on the story behind "Watchmen"
Now, finally, it seems that Snyder has succeeded in not only making the movie, but doing it well. Early reviews of the film have begun to trickle out in magazines and on the Internet and they have been generally positive. Are you looking forward to "Watchmen" or do you think it's all hype? Let us know in the SoundOff box below. As a movie, it is visceral and beautiful and Snyder has remained very true to the source material -- apparently there was a copy of the "Watchmen" graphic novel sitting on Snyder's monitor during filming which the cast and crew would refer to like a Bible. It's ironic then, if not particularly surprising given the complexity of Alan Moore and David Gibbons' epic graphic novel, that even Snyder himself was unsure if he would be up to the job of translating "Watchmen" to the big screen. His first battle was persuading the studio to allow him to make the movie his way. "When I got the project, what the studio had in mind was a PG-13, two-hour movie where [the bad guy] gets killed in the end," says Snyder. "Then it's sequel-able and you've got a 'Fantastic Four' franchise called 'Watchmen.' "
Snyder, who describes himself as a fan, recounts the first time he read "Watchmen." "I mean, at every turn there is some kind of moral lesson or another. Some kind of self-reflexive pop culture allegory, or there is some kind of moral ambiguity." Alan Moore and David Gibbons' graphic novel first appeared in 12 issues for DC Comics between 1986 and 1987. Set in an alternate 1985 -- a dark and paranoid place where Richard Nixon has just completed his fifth term and the world teeters on the brink of nuclear apocalypse -- the story concerns a group of costumed superheroes who fight crime. When one of their number is mysteriously murdered, a chain of events with huge consequences is set in motion. Moore was determined to write the quintessential comic book -- to push the genre to its edge and the graphic novel utilizes intricate multi-layered storytelling full of sub-plots, symbolism, flashbacks and more. "The story itself is a pretty straightforward mystery," said Snyder, "but inside of that, there's this huge plot that has international intrigue and a super-villain and everything you want from a superhero story. "It's at once very traditional and also unusual in the way that it's structured. It doesn't owe anything to any specific genre; it's just its own, true to itself and all of its characters." Snyder knew, despite the difficulties, he wanted to make an adaptation that lived up to the original. But what he had on his side was precedent. His previous film "300," a violent tale adapted from Frank Miller's graphic novel about an ancient Greek battle, had made $450 million worldwide and it helped the studios take a leap of faith. "[The studios] thought 'OK, this is based on a graphic novel, it's rated R and it's violent and it did really well here and there's no big movie stars in it ... it gave them a little bit of faith," says his wife and co-producer Deborah Snyder. Once Snyder got the go-ahead from the studio and a $150 million budget, his next huge task was the screenplay. The intertwining plots and narrative elements of the original novel, including extracts from a book written by one of the characters and a second story about pirates within the story, meant deciding what to include and exclude would be a complicated exercise. "I knew the movie wasn't going to be able to be four hours long so I did have to make some choices," said Snyder. 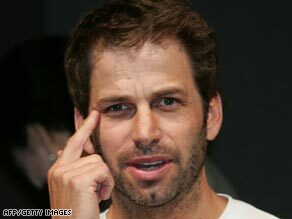 But, adds Deborah Snyder: "Zack respected the source material so much that he knew the only way to adapt it was to hew as close to the source material as possible. iReport.com: Will you watch 'Watchmen'? "Changing the time period or emphasizing any of the characters over the others would never serve the story that's told in the graphic novel, which has always been more than the sum of its parts." He may have been faithful to the graphic novel as he was able, but he hopes that the film will strike the balance between satisfying the obsessive hordes of "Watchmen" fans and being accessible to people who have not heard of the graphic novel. "The person who goes into 'Watchmen' thinking it's a superhero movie is the right guy to see the movie. "He's gonna have the intended viewing experience, in the sense that he's me when I read the graphic novel." Despite Snyder's hopes that "Watchmen" will have the same electrifying effect on fans new and old, he is determined that there will only be one movie. "There's no sequel. I don't know how you would do that without missing the point." "Watchmen" is released in the U.S. and UK on 6 March. Warner Bros. and DC Comics are units of Time Warner, as is CNN.